SIRIUS 3SK safety relays are the key elements of a consistent, cost-effective safety chain. 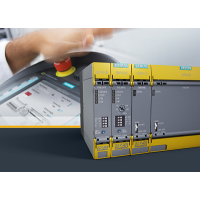 Whether you need EMERGENCY-STOP functionality, protective door monitoring, light arrays, laser scanners or the protection of presses or punches – slimline SIRIUS safety relays enable all safety applications to be implemented in the best possible way in terms of engineering and price. SIRIUS 3SK safety relays are approved for applications up to SIL 3 (IEC 61508/IEC 62061) or PL e (EN ISO 13849-1).